If holding a fishing rod in Cedar Key is in your plans let Southern Salt Charters help you put a bend in it! Capt. Danny is a 43 yr old 3rd generation Cedar Key Native. He was was raised in Cedar Key in a commercial fishing family. This allowed him to spend countless days learning the waters from his father, Uncles and older brother before he started his Charter business 15yrs ago. 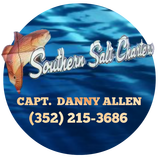 Along that time SSC has been running Capt Danny has been aired on National TV 13 times, and won/placed in multiple lure only redfish tournaments. SSC has served local and visiting clients with great success and has grown every year as we meet and enjoy folks throughout our seasons. Capt Danny runs his charters out of a 24ft custom Shallow Water flats boat that is rigged with all the latest and greatest technologies. Capt Danny would like to invite you to fish Cedar Key his way the way he learned from his Cedar Key family!